I enjoy working to support Noble Purpose Organisations get their best work done. The collective focus of a group of people at all levels and in all roles can achieve so much. This sense of purpose and priority provides the bedrock for the attitudes and accountability needed for the best progress in their important work. However, building this alignment takes time. And it is important to keep re-iterating it once agreed. 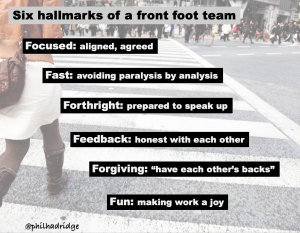 An organisation or team on the ‘front foot’ has the focus that a clear, collective direction provides. But how to get that? There is an approach to ‘scenario planning’ that I find helpful. This is where the group explores and agrees the preferred direction. What is the Default case. What happens, if nothing happens? What is ‘inevitable’ with no change to strategy or no improvement to how things are arranged? The Disaster. How might things go horribly wrong for the overall intention and organisation pursuing it? How close to the default future is this disaster case? The Dream. What is the best case that can be achieved. Not fantasy planning. But realistic with the best organisation of effort. The Different. Having warmed up with these three, what other ideas are there? How to respond to what is driving or demanding some change. What is likely to be the tipping point or moment that defines whether a positive or negative outcome occurs. What to decide to do now and what to try out or explore some more. The ways of working, skills, research and influence that will determine and be needed to achieve the best impact. The insights from this process should be shared widely to help others understand the ideas, and as a reminder. A visual summary in the form of a wall poster or table mat or digital file (and used as an ongoing ‘dialogue map’) can make things clear. Using it participatively promotes the continuing conversation underpinning the timely action needed. Leaders can keep referring to this agreement in the stories the tell and the questions they ask. They ensure it is central to organisational life. With these steps noble purpose groups can start to get and stay on the front foot.